Dr. Vardy participates in a Multli-disciplinary Team Treatment approach to address Pre and Post Surgical Orthodontic issues. The following adult patients were treated by Dr. Vardy. An adult patient with a skeletal discrepancy, in combination with a dental bad bite, may require a combination of orthodontics (to move the teeth) & surgery (to move the jaws). When the lower jaw is too far forward of the upper jaw, resulting in a dental under bite or reverse bite, in a non- growing adult patient, this is called a Class III mal-relationship. A Class II mal-relationship is the opposite, where the lower teeth and jaw are too far back. Dr. Vardy works together with an oral maxilla-facial surgeon, to achieve the results seen below. Sometimes these same patients, when seen prepubertal, their jaws can be redirected to eliminate the need for surgery ie. 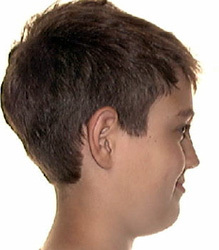 A narrow or retruded/underdeveloped upper jaw can be widened with an expander, before the upper jaw fuses at puberty. However, as an adult, this same problem would require the assistance of a maxilla-facial surgeon, to assist with the expansion. 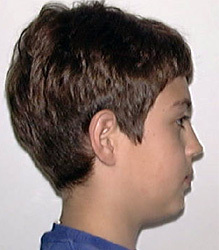 Dr. Vardy not only treats the adults, but many times the children of these surgical/orthodontic cases inherit this bad growth pattern, and bring them in early (American Association of Orthodontics recommends that every child be seen at the approximate age of 7 for an initial consulation with an orthodontist), in an effort to eliminate the need for surgical correction, when seen pre-pubertally. These decisions are based on the dental bad bite, skeletal mal-relationship & soft tissue profile changes desired. A lateral cephalometric & panoramic radiograph in combination with extra-oral/ intra-oral photos & study Models are part of the diagnostics records that Dr. Vardy takes to determine whether a surgical consultation is necessary. If the above bad bites speak to you, please call 212-579-6881 to schedule a consultation with records to diagnose and treat your problem.